After reviewing Cherry Jackpot, we found it is similar in its user-friendly layout to its sister casinos Roaring 21 and Casino Max (whose casino reviews you can read here), however, Cherry Jackpot has a specific focus on slots. Slot titles are at the core of this online casino and are supported by Real Time Gaming software. They began operation as early as 2017, their managing company Entertainment Software Group N.V is a long-standing entity in the international gaming industry which lends creditability. This online destination also provides mobile gaming for on the go players and manages high-quality customer support services. If players are looking for a wide variety of 3-reel, 5-reel, and progressive slot games while enjoying several table games, specialty games, and video poker then Cherry Jackpot is the place to play. Cherry Jackpot Casino is US friendly and one of the most popular names in the industry. They offer competitive bonuses, multiple banking options, and fast payouts. They are licensed and overseen by the government of Curacao and adhere to all licensing and regulatory standards to remain in good standing. IS CHERRY JACKPOT A TRUSTED AND LEGITIMATE SITE? First, this online casino is licensed by Curacao which is a trusted government licensor according to international gaming standards. In fact, numerous top-tier online gambling providers are licensed by the Government of Curacao. Casinos licensed by this jurisdiction all have good standing in the community and are considered legitimate and safe providers. This casino’s Curacao license comes from a reputable offshore jurisdiction which has provided licensing for several big-name online platforms. Their licensing criteria instill several strict standards on licensees which must be maintained in order to remain in good standing. This casino relies on RTG software for its casino games. RTG is a longstanding and highly respected online casino software solution. To go an extra step this casino tests its Random Number Generators every month by TST Systems to audit and certify the games for fair gaming practices. THE ESG N.V. company operating Cherry Jackpot is a team with combined work in the industry accumulating over 50 years of knowledge, meaning they know what to offer and how to treat players. LICENSING AND CERTIFICATION - IS CHERRY JACKPOT LEGAL IN THE US? Due to this platform’s offshore licensing, regulation, and location, they can legally offer services to US players due to free trade laws. According to American law, no federal law directly prohibits the domestic access of licensed offshore online casinos. Therefore, no legal boundaries are violated if US players gamble on sites like Cherry Jackpot. To learn more, visit our gambling laws page. Cherry Jackpot offers a 200% Welcome Bonus for new players which can be redeemed 10x and can only be used for Slots. If Slots aren’t for you, another one-time-only Welcome Bonus on this site is the 100% Deposit Match Bonus up to $1,000 to be used on Table Games, except Baccarat, Craps, Roulette, Sic Bo, and War. Like its sister casinos, this site offers Extra Special Bonuses like 300% Bitcoin Booster Bonus for Slots, a 200% Mastercard Deposit Bonus for Slots, and a 300% Instant Funding match up to $3,000 when using Visa or MasterCard Powered Instant Funding for bankrolls, this can only be used for slot games. All Extra Special Bonuses are redeemable only once and maximum bonuses are limited only by the maximum funding amount for either depositing method used. For players interested in continuous promotions, this site’s 70% Slot Bonus which is redeemable up to 5x per day or their 60% Bonus on Other Games (excluding Baccarat, Craps, Roulette, Sic Bo & War) is redeemable 5x per day, as well as, Free Spin Frenzy with 40 Free Spins for Gemtopia and a 65% Bonus for slots redeemable 5x per day. The remaining available promotions include 24/7 Continual 50% Bonus, Bonus Maximizer Deposit. 40% Cashback, Weekly Special of 75% Slot Bonus plus unlock 100 Free Spins for Dragon Orb only, Monthly Special of a 100% Slot Bonus, Bitcoin Special of 75% for Slots, MasterCard Special 70% Bonus on Slots, Instant Funding Special for a 75% Bonus redeemable once per day. Exclusions and terms can be found on the site’s promotion page for each bonus mentioned here. The software used here is from Real Time Gaming, this means all of their casino games are supplied by this provider. While it is limiting in the number of games you can receive from a single software provider, RTG has been in the business for a long time and thus has a collection of technologically advanced titles available for casinos to pick and choose from. Aside from slot titles, Cherry Jackpot retains a number of other available casino games from video poker, specialty games, and table games such as blackjack, roulette and baccarat. Within each category of games are more specialized versions and multiple variations available for players to explore. For instance, players can try 3, 10, and 52 hand poker, scratch cards, or keno. This site employs high-level security protocols and systems to protect its Table Games and Slots, as well as, site, server, and player accounts and information. In fact, Cherry Jackpot utilizes the highest level of data encryption with 128-bit SSL. This security for data protects players sensitive, personal, and financial information through unbreakable encryption removing any worry about comprised information. Not only this, the online casino also employs the latest firewalls, antivirus tech, and malware protection to ensure nothing gets through. US players can use Credit and Debit Cards at this online platform like Visa, Mastercard, and American Express, deposit minimums are $35 and deposit maximums are at $500. Another method for depositing if credit and debit cards decline is through cryptocurrency, Bitcoin is currently the only accepted crypto with minimums at $30 and maximums at $10,000. This casino’s latest depositing method is Instant Funding powered by Visa and Mastercard which uses these credit cards to purchase “tokens” which can be used at the casino. International players can use EcoPayz, NeTeller, and Skrill with minimums at $35 and maximums at $1,000 for all three. If players need assistance through Live Chat or Phone with depositing, help is available for assisted depositing. This casino only offers two withdrawal methods for US players are only given two options like Bank Transfer with a minimum of $200 and a maximum at $4,000, as well as, Check Courier with a minimum of $200 and a maximum withdrawal of $3,000. Both withdrawal options request a $25 fee. International players can take advantage of withdrawal options like Visa, EcoPayz, NeTeller, Skrill, and Bitcoin – al have a maximum withdrawal set at $4,000 and minimum at $35, except for Visa whose minimum is $100 for withdrawals. No fees are associated with these withdrawal methods. 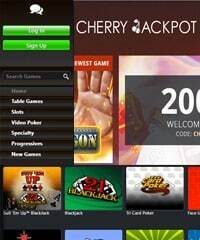 IS CHERRY JACKPOT MOBILE FRIENDLY? Yes, Cherry Jackpot is compatible with several mobile providers, operating systems, and networks. Cherry Jackpot’s mobile site can be perfectly translated on Android, iOS, Windows, Tablet, and iPad devices. Due to responsive design, a desktop-based site can attach its games and functions to their URL and once reached on a mobile device can populate everything provided on their regular website such as games, bankroll, assistance, favorites, and more. Cherry Jackpot can be considered a reputable and reliable online casino brand. Their managing company often lends their 50+ years of knowledge and experience to the younger casino which has allowed it to gain popularity so quickly after inception. The available gaming options found on this site can provide players with hours of entertainment, as well as, reward them with lucrative bonuses. Along with its strong security and easy navigation, this casino has done everything to put its best foot forward.